The conference was held at the excellent Cavendish Conference Centre near Oxford Circus, London, well located for those travelling by rail. 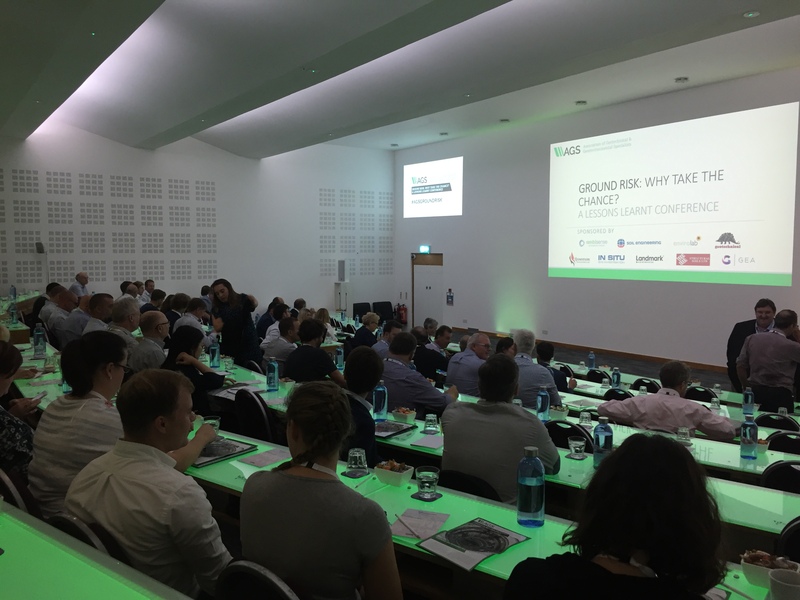 Delegates were greeted by the venue vividly lit up in bespoke AGS green (apparently – for those who are interested – provided by an amBX lighting control system) which gave a stunning backdrop to the proceedings. There was a very good turnout and the location was well set up for networking. Speakers for the event included Stephen Tromans, recognised as one of the leading practitioners in Environmental Law in the UK, award-winning geologist, Dr Jacqueline Skipper, Dr Andrew Smith, Coffey and Brownfield Briefing and GE Award winner, George Flower of Arcadis. The programme was split into two, with geotechnical issues in the morning and geoenvironmental/contaminated land risks covered after lunch. Although each presentation highlighted widely different types and scales of problem and risk, the overriding conclusion on the lessons learnt was that spending time, effort and money at the start of a project to understand the ground conditions leads to a more successful outcome. Simply put “getting the ground model right”. Feedback on the speaker’s presentations was either excellent or good, with one delegate saying it was “one of the best technical conferences I have attended in recent times”. We still feel that we can improve and plan to take all of the suggestions and comments into account when we run a number of similar events in the future, trying different venues and other AGS related content. Our aim is to make our conferences as enjoyable and informative as possible, giving attendees the best opportunity to learn and meet others. This article was featured in the September/October issue of the AGS Magazine.